SkillWorks and the Workforce Solutions Group were the lead conveners of the successful Skills2Compete-Massachusetts campaign. The coalition sought to raise awareness of the need to train Massachusetts residents for middle-skill jobs, which require more than high school but not a four-year degree. These jobs make up the largest portion of Massachusetts' labor market. In collaboration with local partners, National Skills Coalition helped form the Skills2Compete-Massachusetts campaign. Primarily active from 2010-2012, the Skills2Compete-Massachusetts campaign successfully advocated for new investments and policies to better prepare Massachusetts’s workforce with the skills for in-demand jobs. to ensure access to green collar career pathways by lower skilled, low-income adults. increasing training opportunities for lower-income, lower-skilled adults that lead to employment in green collar jobs. Click here for Green Jobs Resources! On September 24th, SkillWorks hosted a briefing on the reauthorization of the Workforce Reinvestment Act (WIA). The briefing provided local, state, and national perspectives on WIA as well as recommendations for reform. 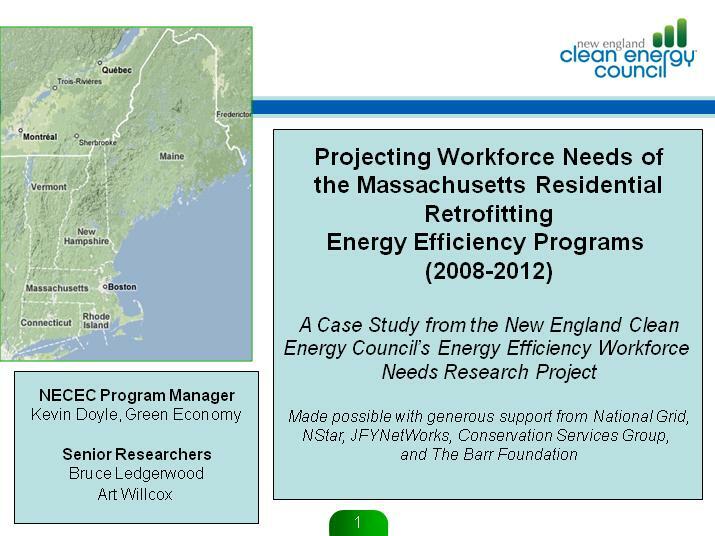 On August 19th, SkillWorks hosted a webinar in conjunction with The Barr Foundation, JFYNetworks, and the New England Clean Energy Council exploring the potential for new employment in residential energy efficiency. Ideas regarding how training programs around the state are responding to both the hope and the hype about green jobs. In April, SkillWorks awarded three planning grants for weatherization/energy efficiency training programs. The purpose of these grants is to assist partnerships in developing competitive proposals for American Recovery and Reinvestment Act (ARRA) funding as well as other Green Job Training funding opportunities. MASSCAP to develop a regional training partnership with CAP agencies in Boston, Quincy, and Southern Middlesex County. Urban League of Eastern Massachusetts (ULEM) to develop their solar installation and preparation program. In this speech delivered by Senator Charles Schumer and sponsored by the Association for a Better New York and 100 Black Men, he describes SkillWorks as " a more systemic, more intimate connection to the employers than most training programs could do on their own." Read the entire speech (PDF). In December 2004, legislation was filed to create a Workforce Competitiveness Trust Fund in Massachusetts. The proposed “Workforce Solutions Act of 2005” would make, the legislation states, “investments in employer and community-based workforce development activities in order to maintain and increase economic vitality in Massachusetts and to promote business competitiveness, worker self-sufficiency, and economic progress.” The legislation was prepared by the Workforce Solutions Group, the public policy advocacy partnership funded by SkillWorks: Partners for a Productive Workforce to work on workforce development systems reform in the state. The conference program for the gubernatorial forum hosted by SkillWorks on June 29th includes background information, candidate questions, and speaker biographies. The Boston Workforce Development Initiative is an innovative response by local and national foundations, the City of Boston, and the Commonwealth of Massachusetts to an increasingly wide skill gap that has left too many job seekers and workers in poverty while employers are unable to meet their needs for a skilled workforce. JFF prepared this PowerPoint to introduce the initiative’s systems-reform approach. This paper, prepared for SkillWorks by the Workforce Solutions Group, analyzes the income inadequacy challenges facing a wide array of Massachusetts families at the end of the 1990s using a variety of alternative measures. Estimates of income inadequacies are presented for families, geographic areas, and demographic and socioeconomic subgroups of famlies across the state and selected sub-state areas. This paper, prepared for SkillWorks by the Workforce Solutions Group, examines the changes in the levels and growth rates of real median family incomes in a wide array of substate areas over the 1980s an 1990s. An executive summary of two reports available below,Treading Water in Quicksand and A Commonwealth Growing Apart, this document highlights the key findings and conclusions reached through this extensive research into income inadequacies for families in Massachusetts. Across the country, funder collaboratives pool funds for fostering the formation and expansion of workforce intermediaries and to advocate for policies that will sustain these new organizations. The power of these collaboratives comes not just from the funds they bring to programs but, even more crucially, from the alignment of civic leadership around a common vision for the community. This report, by JFF's Geri Scott, was prepared for Investing in Workforce Intermediaries , itself a collaboration of the Annie E. Casey, Rockefeller, and Ford foundations. Since 2004, the sponsoring foundations, working with JFF, have led a pilot effort to create a national support infrastructure for workforce intermediaries. In Baltimore, Boston, New York City, and the San Francisco Bay Area, funder collaboratives affiliated with this initiative are supporting local efforts to change how workforce development is delivered.